General Emilio Aguinaldo, a prominent leader in the Philippine revolution against Spanish colonial rule, designed what was to become the Philippine flag during his exile in Hongkong in 1897. It was hand-sewn by three Filipino women by the name of Dona Marcela Marino de Agoncillo, her daughter Lorenza, and Mrs. Delfina Herbosa de Natividad. Delfina is a niece of the Philippine National Hero, Dr. Jose P. Rizal. The following year, on June 12, 1898, the Philippine flag was first unfurled during the Declaration of Independence in Kawit, Cavite. General Emilio Aguinaldo became the first President of the first Philippine republic. The Philippine flag is made of three fields; a blue band at the top, a red band at the bottom, and a white equilateral triangle on the hoist side. At the center of the triangle is a yellow sun with eight rays and in each corner of the triangle is a small yellow five-pointed star. The flags shown above were also used by different factions during the Philippine revolution. 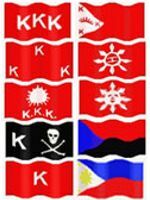 The letters KKK prominent on most of the flags stands for "Kataastaasan, Kagalang-galangang Katipunan ng mga Anak ng Bayan". This electronic book contained on two CD-ROMs has an amazing collection of the finest federal documents and resources about the Philippines, providing encyclopedic coverage of all aspects of the country. Around 127,000 pages when printed and includes country profile, history, American government information and CIA Factbook. A collection of 13 classic folktales of the Philippines such as "The Terrible Giant", "A Feast of Gold", and "The Deer and the Snail". Children can learn the value of honesty, friendship, sharing, and many others in this wonderfully illustrated story book while learning about Filipino culture at the same time. Copyright © 2005 by Limco Products International. 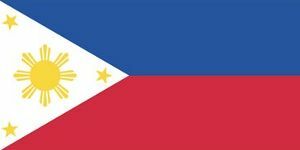 All rights to this Philippine national flag website reserved worldwide.